We’ll update this page with videos and photos from meetings and events. Interim Planning Director Ed McKinney highlights Charlotte’s incredible growth. Kathy Cornett (center), a city planner, explains part of the “Meeting In A Box”. 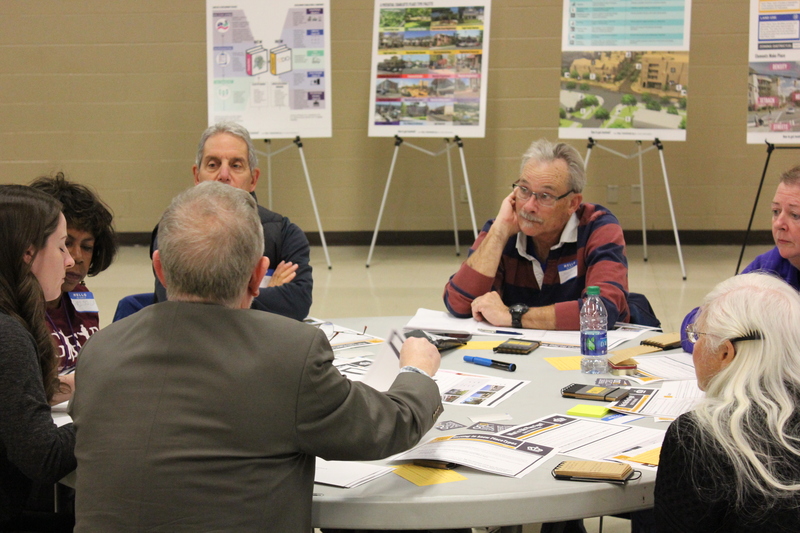 Kent Main (center right), a city planner, discusses Place Types with meeting attendees. People take a quick survey and post their favorite places in Charlotte. This noon – 1 p.m. meeting offers people a chance to drop in during their lunch hour. Surveys are important to City staff – thank you for filling one out! In addition to an opening presentation, information posters are also at every meeting. Can you guess which Form & Pattern element goes with this Place Type? Interim Planning Director Ed McKinney explains the importance of this project. Attendees learn about and discuss Charlotte Place Types. Scott Adams, a city planner, points out Share Your Favorite Place, an interactive map where people can post a photo and description of their favorite places. Alan Goodwin, a city planner, explains Form & Pattern elements of Place Types. Interim Planning Director Ed McKinney notes the two key phases of this project – Charlotte Place Types (Vision) and Unified Development Ordinance (Implementation). Solomon Fortune (upper right), a city planner, leads a table in learning about Place Types. City staff and attendees have lots of conversations about Charlotte’s present and future built environment. Scott Adams, a city planner, highlights CharlotteUDO.org, the project’s website, and many of its online meeting features including “Meeting In A Box”. Kathy Cornett (right), a city planner, and Bolyn McClung (lower right), a planning commissioner, meet with attendees as they learn about Place Types. A presentation introduces Charlotte Place Types and the Unified Development Ordinance (UDO) and then table exercises allow attendees to learn more about this important project. We’re mentioning our website (Congrats, you found us!) and our social media hashtag #CLTUDO at every meeting. Julia Zweifel (lower left), a city planner, leads a table in learning more about Place Types. This meeting occurred in the University City area, so Place Types in this area adjacent to the Blue Line light rail line will emphasize transit-supportive elements such as shorter block lengths, bicycle and pedestrian access, and various housing types within walking distance of light rail stations.